I gave up the word can't and learned how capable I am. As one of my New Year’s resolutions and Lenten sacrifices, I thought of my teacher's words and gave up using the word “can’t” to become the best I can be. As a girl, I was often told that I can’t be or do certain things simply because I was a girl. Although I don’t believe any of these, I found that I was internalizing this “can’t” mentality. I was saying “I can’t” for everything and anything, like if I didn’t want to do something. 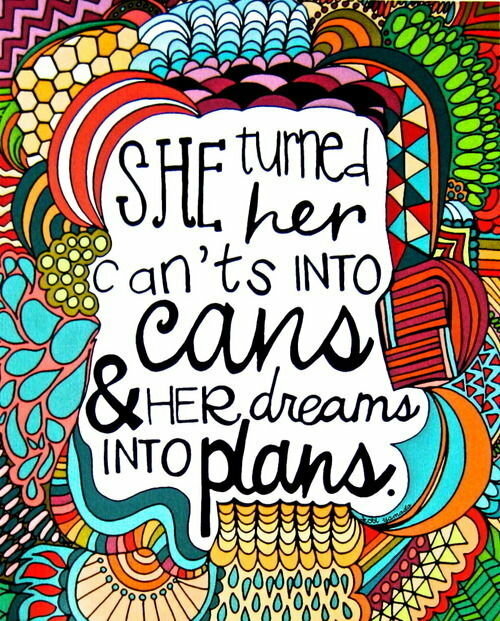 I am capable, however, so all I needed to do was turn those “can’t” into “can”s. So how can you give up something like this? For me, whenever I caught myself saying or thinking “I can’t” then I rephrased it as something “I can do.” It’s not that I can’t lift 20 lbs, but rather that I can currently only lift 10 lbs when I workout. Consider not just saying that you "can" but also writing it down so that you can have a good, visible reminder of how capable you are. If you want to take this further, rephrase your “can’t”s into “can”s, and then actually do them. This encouraged me to try things I previously thought I was incapable of just to see what I could do. So I can and I will. So go become the best you that you can be! Turn your “can’t”s into “can”s and see what you are capable of.